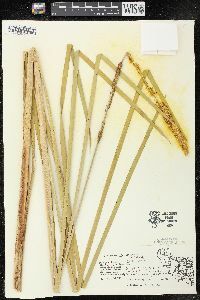 Perennial colony-forming herb 1 - 3 m tall Stem: erect, unbranched. 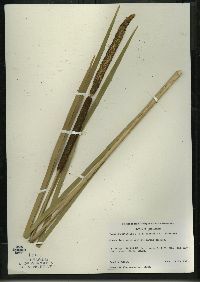 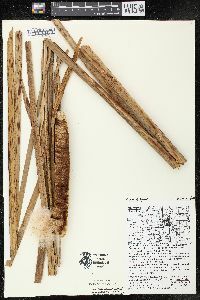 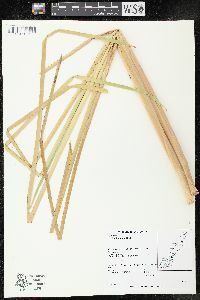 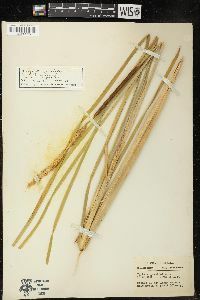 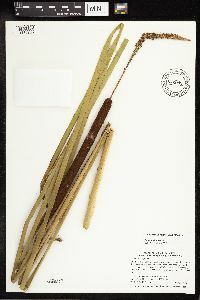 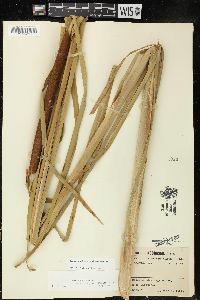 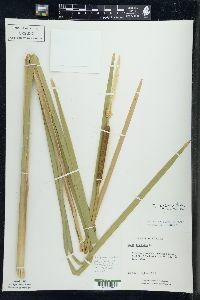 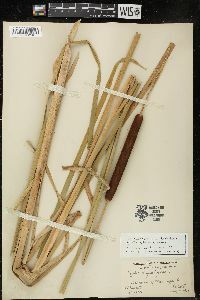 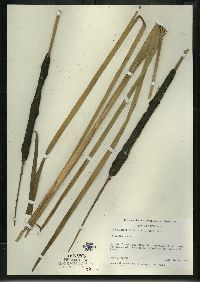 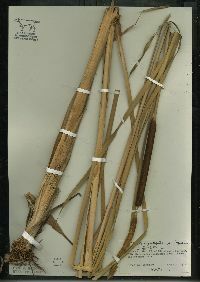 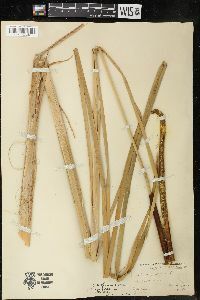 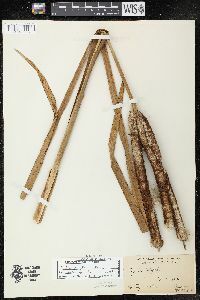 Leaves: sheathed at the base, long and narrow, 6 - 11 mm wide when dry, flattish to convex below the middle, loosely twisted. 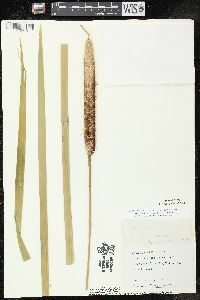 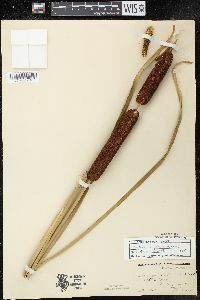 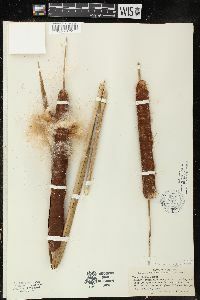 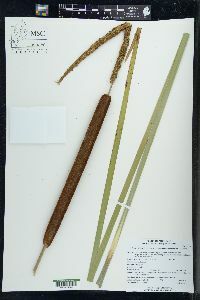 Inflorescence: a dense cylindric terminal spike with male part separated above the female part by a distinct but short break, female part often longer than 16 cm. 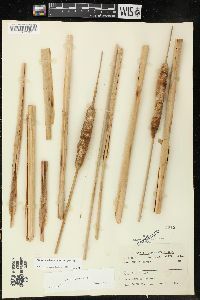 Fruit: a tiny, sterile, dry follicle borne on a slender stalk having many long white hairs. 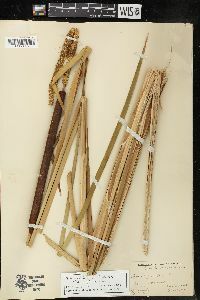 Female flowers: with stigmas intermediate of the parents. 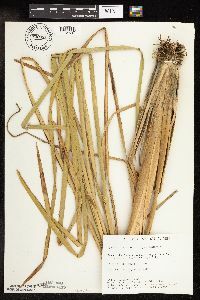 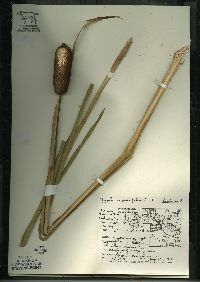 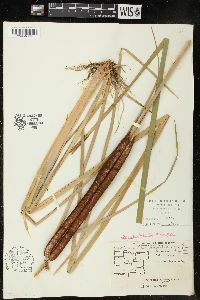 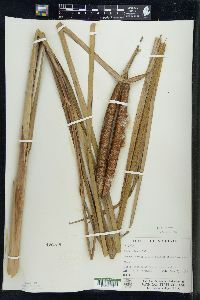 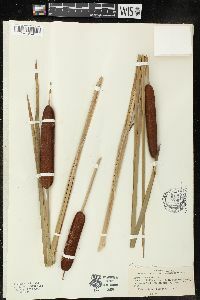 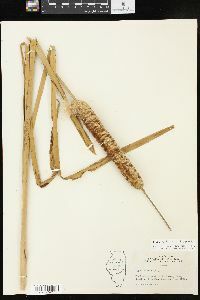 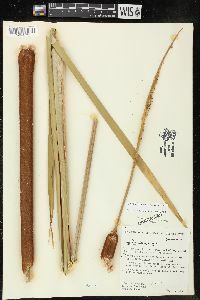 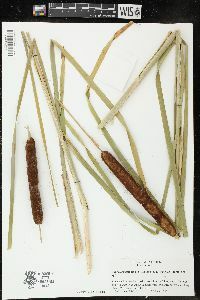 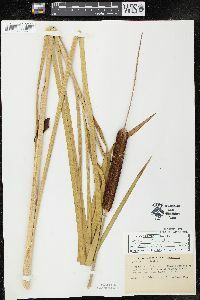 Similar species: Typha x glauca is a hybrid of T. angustifolia and T. latifolia and can often look very much like either or both parents. 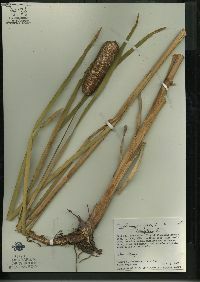 Certain hybrid crosses produce individuals with attributes intermediate to the parents. 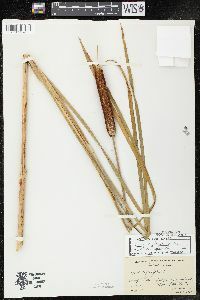 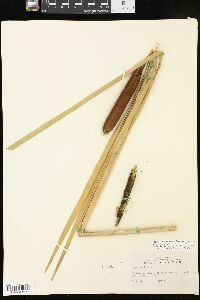 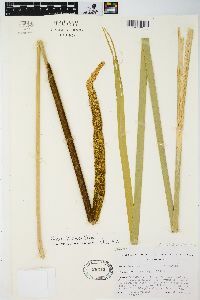 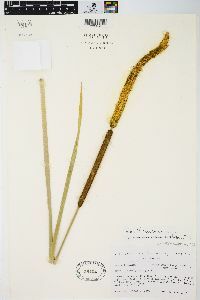 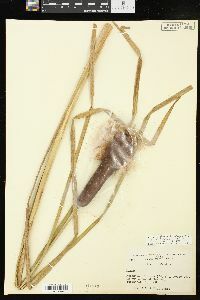 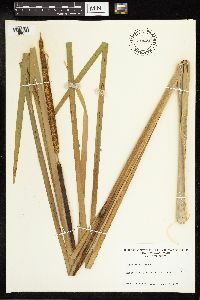 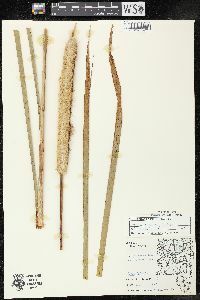 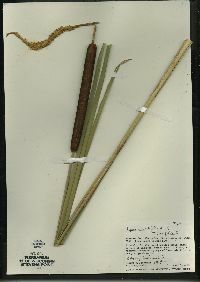 These characters include the leaf and stigma widths and the degree of separation between male and female parts of the inflorescence. 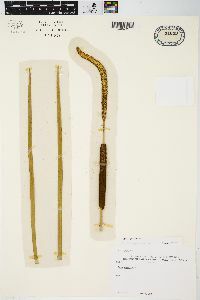 It is unreliable, but in the hybrid the female part of the inflorescence is often longer than 16 cm, which almost never occurs in T. angustifolia and rarely occurs in T. latifolia. 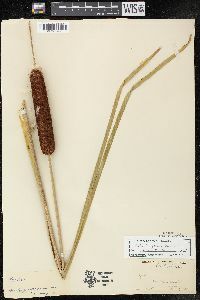 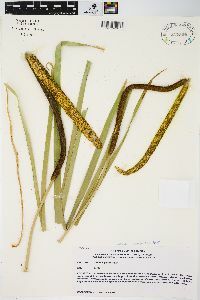 Unfortunately the three most common species of Typha in the Chicago area are incredibly similar in gross morphology and one must look at the flowers and fruit (and often pollen) under magnification, and even then the identity may be inconclusive. 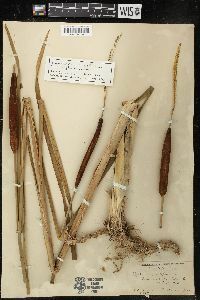 Recently, DNA technology has become the best tool for distinguishing the taxa. 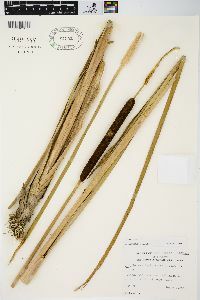 See links below for further information on the parents. 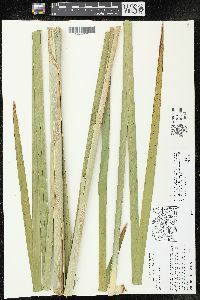 Habitat and ecology: This invasive taxon is very common in the Chicago Region and often forms solid stands in marshes or wet soils. 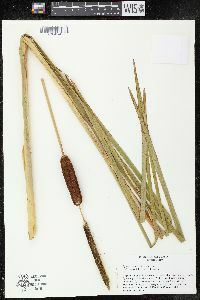 In our area it is by far the most common taxon in the genus Typha. 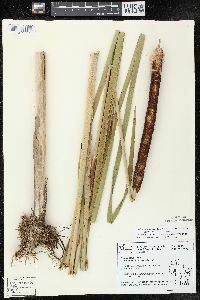 This hybrid out-competes both the native species, T. latifolia, and the non-native T. angustifolia, which are its parent species. 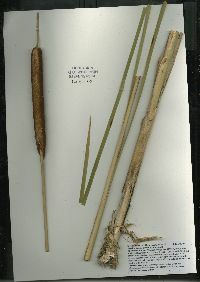 While the fruit are sterile, the hybrid reproduces vegetatively and forms solid stands that exclude most other native wetland plant species. 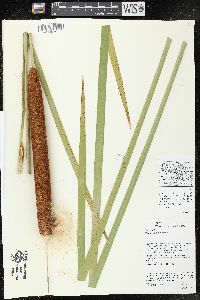 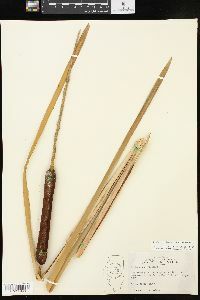 Most wetland restorations incorporate killing all cattail (with herbicide, burning, or controlling water levels) in order to attempt reintroduction of native wetland plants on a more open landscape. 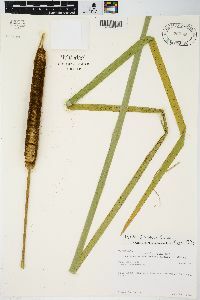 In most cases one can only hope to control the hybrid cattail populations rather than fully eradicate it. 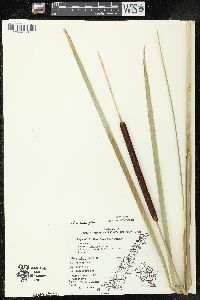 Etymology: Typha comes from the word typhe, the old Greek name for cat-tail. 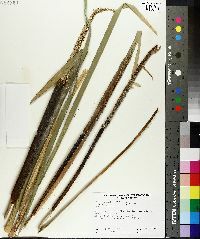 Glauca means glaucous, or "covered with a whitish waxy coatiing."